SIX SENSES SPAS has spent the past two years working with some of the most highly respected doctors and wellness professionals, including Dr. Mehmet Oz, Dr. Michael Breus and Dr. Steven Gundry to develop an approach to wellness which addresses some of the most common issues people face as a result of their ultra-stressed daily lives. The result is Six Senses Integrated Wellness – an innovative approach to wellness that allows the group’s in-house experts to measure and analyze key physiological biomarkers to provide guests with lifestyle and nutritional advice, and design a personalized program of spa treatments, fitness and wellness activities based on the preventative principles of the Eastern medicine approach and the results-oriented Western influences. There are several building blocks that form the foundations of this concept, including nutrition to help guests understand the basic principles of healthy and nutritionally balanced eating; sleep health to optimize sleep and understand its benefits on their over-all well-being; movement through the variation of high and low intensity exercise; alternative therapies; holistic spa treatments as well as yoga, meditation and mindfulness to balance the nervous system. The ultimate goal is to offer guests real benefits and guidance by providing in-depth information about their health and personalizing every aspect of their stay at Six Senses resorts to enhance their lives and well-being. This winter sees the introduction of Six Senses Integrated Wellness through the launch of personalized wellness programs designed by Six Senses in-house wellness experts. Each personalized wellness program begins with a wellness screening which uses a finger oximeter to observe the heart rate, tissue oxygen uptake and distribution, arterial stiffness and stress parameters. The screening technology uses the Electro Interstitial Scan-Galvanic Skin system that provides useful information by measuring and interpreting resistance to the flow of gentle electric current through interstitial fluid (fluid between the cells) throughout the body. The programs help to address the most common concerns around digestion, weight loss, elimination of built up toxins, weakened immune system, sleep, stress relief, muscle toning or building better stamina. It also helps guests achieve their full potential should they wish to be challenged and improve their current performance. At the end of the stay, each guest receives a post-program follow up consultation during which Six Senses wellness experts provide advice and tools on how to continue and maintain a healthy lifestyle at home. A follow-up wellness screening session is recommended for programs of one week and beyond. The underlying principle of this approach is for guests to take charge of their health, while experiencing joy and fulfillment in what they do. At Six Senses believes that without enjoyment, incentive diminishes and the results are simply more difficult to achieve and maintain long term into the future. Six Senses Wellness Screening and program personalization are now available at Six Senses Zighy Bay, Six Senses Laamu, Six Senses Yao Noi and Six Senses Douro Valley as well as partner Six Senses spas at Puente Romano Resort & Spa in Marbella, Al Bustan Palace in Oman, Soneva Kiri in Thailand and Soneva Fushi in the Maldives. Personalized programs at Six Senses Yao Noi and Six Senses Spa at Soneva Kiri also incorporate a performance test with Fusionetics, an evidence-based sports science platform to help guests understand, monitor and improve their personal fitness levels. Fusionetics is the compilation of over a decade of research and field-testing led by Dr. Michael A. Clark, scientists, sports medicine professionals, coaches, athletes and business leaders who have relentlessly pursued their passion for perfecting human movement. The test involves conducting six different movements and the execution of these being registered on a platform. The results optimize performance and reduce the risk of injury through a variety of training techniques. A personalized program includes one wellness screening, one spa treatment per day, one private wellness or fitness activity per day, access to spa facilities and complimentary access to selected group wellness classes. FOUR NEW GROUP DIRECTORS of Operations roles have been created by Centara Hotels & Resorts in response to the rapid growth in Centara’s property portfolio. With properties in diverse regions, each requiring specific attention, there will now be greater concentration on the strategic areas for Centara, and to strengthen the product offerings and services. Starting his career with Centara in 2007, Robert Maurer-Loeffler has been promoted to Group Director of Operations for Bangkok & City Hotels. Prior to his promotion, Maurer-Loeffler was general manager of Centara Grand & Bangkok Convention Centre at CentralWorld. With a deep understanding of the Centara brands and products, Austin Robinson has been promoted from Area General Manager Phuket, overseeing Centara Karon Resort Phuket, Waterfront Suites Phuket by Centara, and Centara Kata Resort Phuket to the Group Director of Operations, responsible for properties in East Thailand and Vietnam. Robinson started his career with Centara in 2011 as the general manager of Centara Pattaya Hotel and Centara Nova Hotel & Spa Pattaya. Since joining Centara in 2014, Harry Thaliwal has been instrumental in leading the development of one of Centara’s newest brands, COSI Hotels. His role has now been expanded to Group Director of Operations, responsible for South Thailand, Sri Lanka, Bali and the COSI portfolio. Kamal Chaoui, the latest addition to Centara’s management team, has been appointed Group Director of Operations – Premium Resorts responsible for Centara Grand Resorts, the company’s five star brand. Chaoui, a French national with over 29 years of experience, Chaoui started his career with Hyatt International Corporation where he spent 16 years in various postings worldwide. He has also worked with Banyan Tree Hotels and Resorts, InterContinental Hotel Group. Before taking on this new role, Chaoui was the general manager at the newly opened Dusit Thani Abu Dhabi. He brings a wealth of knowledge and global perspective that will help in further developing brand standards and operational quality. “It is very rewarding to see the continued growth and development of our Centara members. I am pleased to know that they are as passionate about the success and development of Centara as I am,” said Thirayuth Chirathivat, CEO of Centara Hotels & Resorts. WANT TO MAKE EVERY DAY feel more like a SPA day? The experts at SPA Cenvaree would like to share a great body scrub that help you feel invigorated and that you can do at home. 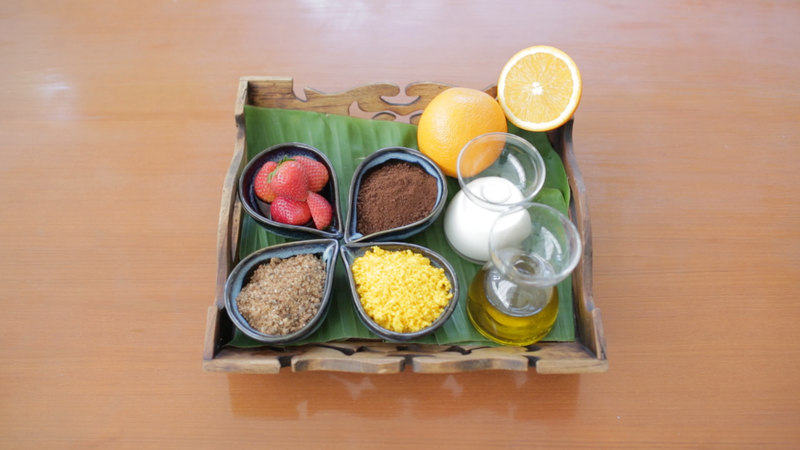 For the Strawberry Body Scrub you’ll need: Fresh strawberries, brown sugar, medium ground orange peel, instant coffee, olive oil and fresh milk. You’ll need to make strawberry cream first. All you need is five fresh strawberries, 100ml of fresh milk and 20 ml of olive oil. Put the strawberries, milk and olive oil in a blender and blend until smooth and pour the mixture into a small bowl. Depending on the quantity of scrub you would like to make, mix the same amount of each – brown sugar, medium ground orange peel and instant coffee – in a bowl. Once you have completed the strawberry cream and the scrub, you are ready to spa. Take some of the strawberry cream and gentle rub onto skin where you would like to scrub. Next, apply some of the scrub mixture on top of the cream. In a gentle circular motion massage your skin for about five minutes. For best results, only scrub two to three times a week. Rubbing in a circular motion gets your blood circulating and also helps to smooth the skin without causing irritation, which can occur from a back and forth motion. After a scrub, it’s important to moisturize, which will further help to give you smooth, supple and healthy skin. At SPA Cenvaree, an important part of the experience is creating a cocooning environment. You can create a similar atmosphere at home quite simply. Start by setting the scene. Turn off your phone, dim the lights (better yet, just have candle-light – the flickering flame invokes inner stillness). Burn some essential oils (black pepper and kaffir lime are personal favourites) and turn on your chosen Enya-inspired CD. We do not recommend using this body scrub on your face as your face is more sensitive than the skin on your body. SPA Cenvaree has highly trained, knowledgeable, and nurturing staff that can help you unwind and relieve your body of stress and infuse transformative energy that can promote healing and balance. Centara has over 35 branches of SPA Cenvaree along with our value brand ‘Cense’ by Spa Cenvaree, where you can go to enjoy the variety of Thai treatments. For more information about SPA Cenvaree and its philosophy, visit http://www.spacenvaree.com/. IT ALL STARTS with a grand buffet dinner on Christmas Eve that will feature its Christmas Carolers, followed by a Christmas set lunch on Christmas Day, and another grand dinner on New Year’s Eve and a pool party. Christmas Eve set dinner at La VIE – Creative French Cuisine will feature appetizers, Jerusalem artichoke cream soup with black truffle, sous-vide turkey bread roll with confit potato, and more. The evening will be accompanied by a live trio of our own VIE carolers singing the heartwarming songs of the season and plenty of Christmas spirit. Three-course Christmas set lunch, also served at La VIE – Creative French Cuisine, with feature holiday dishes and “everything just the way it is meant to be on Christmas”. Cost – 790 THB per person and served from noon to 3 pm. Toast the old year out and welcome in the New Year at a grand buffet dinner. Cost – 3,500 THB per person and includes a welcome glass of sparkling bubbly. The dinner is served from 7 to 10.30 p.m.
Then, top off the evening at VIE’s New Year’s Eve party at the hotel’s rooftop pool with a fabulous view of the city coming alive at the rousing countdown with music by special guest DJs. Entrance fee is 1000 THB and includes three drinks, during 9 p.m. – 1 a.m. THIS HOLIDAY SEASON all five senses will be invigorated with the chocolate and vanilla scents that are incorporated into SPA Cenvaree’s special package. It’s all part of a variety of seasonal treatments that are designed to get you ready for the new year. The treatments showcase and are inspired by Thailand’s rich cultural heritage and tradition of personal care, in which internationally-experienced spa teams offer a unique blend of Thai therapies and modern knowledge. The journey begins with a Floral Foot Bath that helps to wash away any negative energy followed by a deliciously-scented Chocolate Body Mousse that helps to gently exfoliate the skin, leaving it soft and smooth. Chocolate has many wonderful benefits such as it is rich in Vitamins A and E, which help to repair the skin cells and rejuvenate it. In the Mousse you can also find hints of coconut, lime, and orange along with the aroma of the cocoa. Those first two treatments are just to get you warmed up for a Vanilla Body Massage. Rhythmic and soothing massage strokes further promote ultimate relaxation and enable you to release any tension or stress. The vanilla shea butter and aromatherapy oil help to hydrate the skin while relaxing the sense with the exotic scent of vanilla. It ends with a gift of the Heavenly Vanilla shea butter and body wash to take home with you. “When we created our spa package, I wanted our guests to undergo a cocoon-like, nurturing and comforting experience – one where they emerge feeling lighter in being and as though something has shifted on the inside. 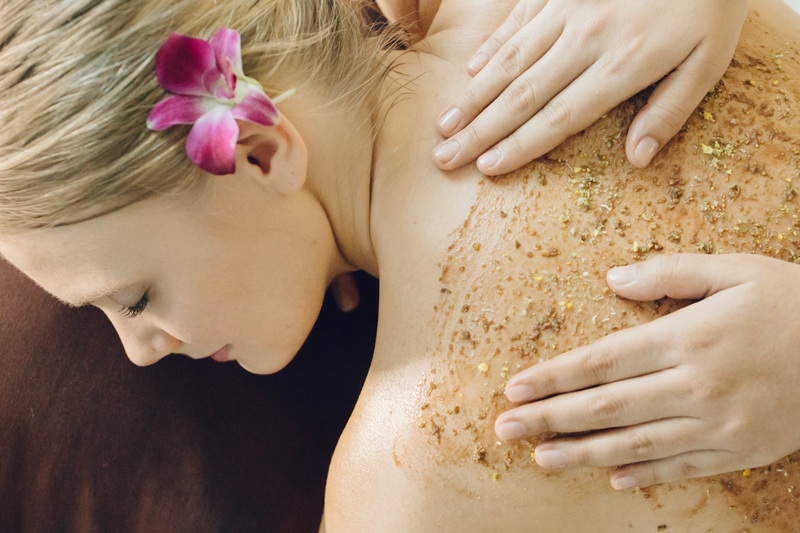 It also helps that the treatment incorporates the delicious scents of chocolate and vanilla,” said Tara Hanrahan, group director of spa operations for SPA Cenvaree at Centara Hotels & Resorts. The package will allow you to escape for 90 luxurious minutes, which can be experienced at any of Centara’s SPA Cenvaree locations as well as at Cense by SPA Cenvaree, and is available from December 2015 to January 2016. For more information, visit Centara’s website or call 66 (0) 2 769 1234. 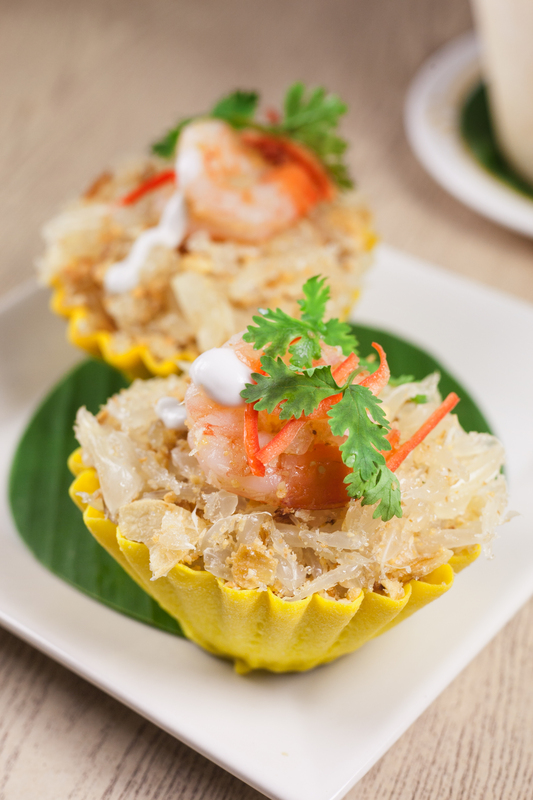 THIS MONTH’S RECIPE comes from Dhara Dhevi in Chiang Mai and features a favourite dish of its guests. It’s also a favourite at the resort’s Culinary Academy, and does not require a lot of preparation. 100 g pomelo, 2 tbsp peanuts (deep-fired), 2 tbsp roasted ground coconut, 3-5 pieces of bird’s eye chilli, 1 tbsp garlic (deep-fried), 1 tbsp shallot (deep-fried), ½ tbsp sugar , 1 pinch salt and 1 tbsp of dried shrimp (deep-fried). Peel the pomelo and tear into small pieces, cut the bird’s eye chilli into thin slices, then add all the ingredients and seasoning sauce into a mixing bowl. Stir well and serve.